The official countdown to the Let’s Dance International Frontiers has begun! Serendipity is gearing up for its 9year of LDIF. 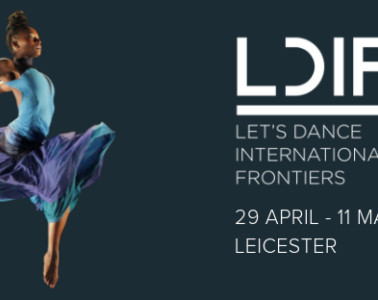 Marking International Dance Day, Serendipity launch LDIF 2019 in the historic setting of Leicester Cathedral. The event will host National and International artists, coming to Leicester to launch our festival in style. The festival, running for 10 days across 7 venues around Leicester, Serendipity hosts a variety of styles, showcases, workshops, as well as networking events. The line-up will feature artists from Haiti, Japan, Italy, USA, and Guadeloupe, exploring contemporary dance that has grown out of African and Caribbean dance aesthetics. Opening the programme is Haitian choreographer Jeanguy Saintus and his company Ayikodans. With a piece set to showcase the emergence of Contemporary-Haitian dance, Saintus and company bring their revolutionary style to one of the most culturally diverse cities in the UK at the historic and beautiful Leicester Cathedral. Ayikodans arrival to LDIF marks a pivotal moment in the dance world, showcasing a style rooted in folkloric tradition whilst exuding modernised Caribbean culture. From Black Dance: Voice Conference to a masterclass with Ronald K Brown, there is no better way to continue the celebrations following on from international dance day. For more Ticket information, click the link below.